If you like Europe and its history... its romance and culture... then Spain should be calling your name. Loudly. It offers sophistication, charm, comfort... and, in places, at a price you'd expect to see in Latin America. The value today is truly excellent... in fact, in the 30-plus years we've been writing about Spain, we've never shouted "go now" with such enthusiasm. Your dollars go a long, long way today in lovely pockets all over the country — hilltop towns, beach retreats, cosmopolitan cities. Fire sales offer eye-popping deals. And even at full price, the values are genuine... and the cost of living is modest. A couple can live very well here for less than $30,000 a year. Plus right now the favorable exchange rate is making the equation ever more attractive. In fact, the dollar is about as strong today against the euro as it's been in the last decade. And that means Spain is, effectively, "on sale" if you're shopping with dollars. So there’s an unusual opportunity right now to leverage your increased buying power and pick up added value when you’re shopping — whether it be for your dream property or simply a good dinner out! You might enjoy exploring the country's southern coast for some of the most pristine (and un-crowded) beaches in Europe (yes those beaches still exist, you just have to know where to look). My name is Glynna Prentice, and I'm a long-time editor at International Living. In the 1970s, traveling after I finished college, I lost my heart to Spain. Its romantic—and rich—history, its people, and the rhythm of the days captured me. Years later, when I lived and worked in Madrid, for instance, I loved the lifestyle. I loved going to lunch with my work colleagues. Make no mistake; we worked hard. But every day we took time for a civilized, sit-down lunch, in a restaurant, away from the office...because this is what you do in Spain. Life here is easy...relaxed...and wonderful. And it's not just the cities that have drawn me back time and again...yes, Barcelona is fabulous with its attractive urban beaches, vibrant cultural scene, and lively street ambience...but Spain offers a lot more than just buzzing cities. I love visiting Spanish villages...walking through the cool, quiet aisles of medieval churches and having a drink in the main square, under the shade of spreading elms. Spain really does have it all...and now is the time to check it out. Spain is arguably the best bargain in Europe today, offering First-World living at a cost that can compete with some spots in Latin America. We're talking serious bang for your buck. On much of the Mediterranean coast, you can buy a beach condo today for $150,000 or less—sometimes much less—when you know where to look. Within walking distance of one of Barcelona’s most popular beaches, you can own a two-bedroom apartment with a balcony and 430-square-foot of living space. This area has a Greenwich-village feel with tons of cafes and vibrant shopping. Price for this apartment? Just $190,970. In a laid-back artists and artisans' enclave full of university students, you'll find a hilly, medieval core where buildings are made of cream-colored stone and the streets are cobbled. Here a bridge designed by Gustav Eiffel spans the river that bisects the town. And in this pretty, culture-rich community of nearly 100,000 you can own a three-bedroom, one-bath apartment, with plenty of light and near all amenities for just $109,510. Right on the Mediterranean coast, you can be close to the water and have great views from a 915-square-foot, two-bedroom apartment. It has sea views, a balcony and is conveniently near all shopping…all for just $91,530. These are the kinds of prices you expect to see in Latin America where, along with the good values, you usually make a few compromises, too. But in Spain... it's First World, old-world, easy, comfortable... AND remarkably affordable. Even before the recession, Spain was one of the least-expensive countries in Western Europe, and that remains true. "In the late afternoon, all the locals gather to stroll and to stop for a drink, and I did, too. A glass of good local wine at a terraza, with a free plate of olives as a tapa, cost me about $3.90—and it wasn't the cheapest wine on the menu." Day-to-day expenses, for instance, can be very low. Pick one of the many areas with a warm, mild climate, and your monthly utilities can run you $136 or less. Spain's airports are sleek and modern...fast highways and high-speed trains link all the major towns and cities around the country...and everyone, it seems, has a cell phone. I'd like to show you exactly where—and how—to take advantage of the best Spain has to offer right now in our newest, most comprehensive guide to this country, called Escape to Spain: Everything You Need to Know to Retire Better, Invest Well, and Enjoy the Good Life For Less. The click of castanets, the swirl and passion of flamenco dancers, whitewashed villages tumbling down hillsides toward the blue Mediterranean...for many people, this is their impression of Spain. Spain is one of the largest and most geographically diverse countries in Europe. Depending on where you are, the terrain, the look of the people, the accents—even the language they speak—can be different. In Spain, you can find almost any sort of geography you choose. "Beyond our Wildest American Dream"
And living in Spain, no matter where you go, won't break the bank. A couple can live well in many towns on $2,000 a month, including rent...eat out for less than $30 (and you'll want to—Spanish food is amazing)...and travel the country by rail or bus at discount rates. Speaking of transport, no matter where you live in Spain, you'll have easy access to the rest of the country—and to the rest of Europe, too. Modern, high-speed trains can get you from one end of Spain to the other in about seven hours. You can fly directly from North America to Madrid, Barcelona, and other metropolises. The many smaller, regional airports can zip you around Spain and to the rest of Europe (often on cheap, discount airlines). If you're worried about the healthcare here...don't be. Spanish healthcare has a good reputation, with excellent medical schools and many qualified doctors. In the major cities and popular tourist destinations, you are likely to find health care every bit as good, if not better, than what you have back home, with attentive care and modern amenities. You'll get the details about where you can embrace this good life for less today in Escape to Spain: Everything You Need to Know to Retire Better, Invest Well, and Enjoy the Good Life For Less. Expats already on the ground love it... "We can drink coffee from our bedroom while watching the sunrise to the east, and in the evening sip wine on our balcony while watching the sunset over the Mediterranean," says expat Shane Kutz. "Before moving to Spain we could not have imagined that our standard of living would be so breath-taking." Another transplant to Spain says she appreciates the laid-back, "Old World" lifestyle. "One of the things I like most about living here is that I don't need a car to get around. That's a big change from life in California, where people practically live in their cars. My husband goes to work by bike, and the kids can take a five- minute walk to school. Then I stroll to the center of town to buy freshly baked bread for lunch, which in Spain is usually around 2 p.m. or 3 p.m.
"Everything is just a walk away. There are a couple of small grocery stores, a medical center, a sports complex, a pharmacy, and, of course, several bars where you can enjoy a glass of wine before lunch (Navarre's specialty is rosé). For anything else I might want, Pamplona is just a 10-minute bus ride and costs me just 75 cents each way." Ben Ostrom says of life in his adopted hometown of Seville, "Blue skies more than 300 days a year, restaurants and tapas bars lining the streets, and culture pouring from every corner...It's one of the architectural jewels of Spain. "I've been living here six years now and I love how you can choose your lifestyle. If you prefer to live the simple life, groceries are cheap, or you can eat out without breaking the bank. For breakfast, a tostada con jamon (cured ham on toast) and a coffee will set you back $3.50, while dinner for two and a couple of glasses of wine is around $20. "Having traveled the world and lived in dangerous cities, I love feeling safe in Seville. The atmosphere is pleasant. There is a large expat community and you can mingle with Brits, Irish, Americans and Canadians. My wife and I have private healthcare and pay $120 a month between us. I've been to the hospital a couple of times and the service was excellent." There are lots of tempting reasons to consider making Spain your new home, and now is the time to think seriously about it. "In Spain you'll find plenty of genuine local retreats and unexplored corners, age-old villages where women still wash clothes at the local fountain, or the occasional burro pulls a cart. "I love the plaintive lament of gypsy guitars you hear in Spain...its orange and jacaranda trees...a Moorish fortress...the taste of fresh anchovies...the raisiny aroma of oloroso sherry aging in dark cellars." As I mentioned before, since the financial crisis engulfed the country, Spain's property market is on the floor. Bargains abound. It's no secret that the global economic crisis has affected Spain's real estate scene. For 15 years, real estate prices there soared. Then in 2007 demand slowed. By the time the worldwide economic crisis rolled through Spain and Europe, the real estate bubble had well and truly burst. A three-bedroom, one-bathroom, apartment of 732 square feet within walking distance of a popular beach resort. Price: €74,000 ($82,880). A three-bedroom, one-bathroom apartment with a balcony and 753 square feet of living space in the Old Town of Hemingway’s favorite hangout. Price: €114,000 ($128,820). In one of the Costa del Sol's most popular (and nicest) towns, is a two-bedroom, two-bath apartment with sea views and over 900 square feet of living space. It's a short walk to the beach. Price: €81,000 ($91,530). In Escape to Spain we'll tell you where you'll find these—and many other—affordable properties. Properties with price tags you'd expect to see in Latin America. But you don't have to buy. There's nothing to stop you renting for a few months and enjoying the unique Spanish lifestyle. In Escape to Spain we also look at rentals and give you all the info you'll need if you do decide to enjoy Spain for a few months at a time. There's nothing to stop you renting for a few months and enjoying the Spanish lifestyle part of the year. In Escape to Spain we look at rentals and give you all the how-to details you'll need if you do decide to enjoy Spain for a few months at a time. Escape to Spain also includes our editors' insider travel tips: The best ways to get there and get around...where to learn about bullfighting...the best tapas in Andalucia...undiscovered wine towns...and lots, lots more. Consider Girona, for instance, about 50 minutes from the Barcelona Airport. This is a university town where the Onyer River provides lots of water views. The popular Plaça de la Independència has colonnades lined with restaurants and tapas bars. In late afternoon all the locals gather here to stroll and to stop for a drink. A glass of good local wine at a terraza starts at €2.50 ($2.75) and it comes with a dish of tasty, locally-cured olives as a tapa, for free. And you can rent an apartment here in the center of town for as low as €425 ($485) a month for student-style digs. For €500($565) a month, though, you can get one or two bedrooms and at least 700 square feet of space, all in good condition. For €750 ($848) a month you'll get a family-sized apartment, with perhaps three bedrooms and 1,000 square feet or more of living space. Or if you'd prefer life on the Mediterranean... I think you'll be pleasantly surprised at the rental bargains to be had there, too. Take, for instance, a little town we recommend about 30 minutes from the big city of Cartagena. This place, right on the coast and surrounded by golf courses, hiking trails, and lovely sand beaches, is an unsung gem. Its 15,000 permanent residents have a good range of shops and supermarkets, as well as a covered market and Sunday street markets—it's a proper town. But along with its stunning beaches, it boasts miles of promenade, a new marina, and numerous bars and restaurants. Scuba diving, shore fishing, and sailing are year-round activities. And here—the values are truly extraordinary. You can rent apartments long-term starting at about €350 ($396) a month. But vacation rentals are also inexpensive here, working out to as little as about €15 ($17) per person per night. Talk about "Latin American pricing!" The modest cost of living in Spain is no exaggeration. You really can enjoy the richness of life in this diverse country for a lot less than you may think. Let's take a look at a typical budget in Alicante, for instance. To give you some context, this town on the Mediterranean is situated in the Valencia region, the garden of central Spain. Inland Valencia is home to vast vineyards and to cultivated fields growing vegetables of all kinds. Valencia also grows rice—not surprising in a region whose signature dish is paella. But Alicante is on the coast, what's called the Costa Blanca, which boasts what is arguably Europe's best climate, with 325 sunny days a year and low humidity. Unlike other towns along Spain's Costa del Sol, which were overbuilt and attract hordes of British tourists, Alicante is pretty and sophisticated and many visitors are Spaniards. There's a convenient airport here so it's easy to get in and out of. And Alicante has eight splendid beaches. Below St. Barbara's Castle, an old Moorish fortress, there's a marina, parks, shady plazas, cinemas, and a theater. So the living is not just comfortable, but a notch above. And it'll cost you less to live here than you probably imagine. Now, the health care cost is based on the Sanitas (Spain's largest private health- insurance company) rate of €123.26 ($138) per month per person for a healthy 65-year-old. For reference, the monthly rate for a healthy 55-year-old is €90.35 ($101). The plan includes complete health care plus and dental, with optional pharmacy. Depending on how you choose to spend your money, your individual budget could be more or less than the one here. Small apartments in Alicante start as low as €300 ($337) a month...or can be €1,000 ($1,1123) or more if you want a large house with pool, ocean views, and other luxuries. Likewise, you may choose not to have a maid, or to spend more on entertainment. But a couple should be able to live comfortably on $2,000 a month in Alicante or a number of beach destinations in southern Spain. Rent in large cities like Madrid, Barcelona, and Bilbao, and in some northern coastal areas like San Sebastián and the Catalan Coast, will be somewhat higher. Still, we're talking about less than $30,000 a year for a couple to live comfortably and enjoy the pleasures of life in a beautiful, welcoming, friendly, sophisticated European nation. In Escape to Spain: Everything You Need to Know to Retire Better, Invest Well, and Enjoy the Good Life For Less, we'll share with you stories from expats already enjoying Spain as well as insiders' guidance about living, renting, and buying property there. You'll find examples of what's on the real estate market... the best things to see and do... and much, much more. SAVE TIME! Whether you're a city, mountain, or beach person, there's a perfect place in Spain for you. And we provide the pros and cons to help you narrow down the choices. We've done the legwork so you don't have to, and it'll save you hours of painstaking research and expensive travel time. We'll help you pick the locales in the country that best fit your lifestyle. SAVE MONEY! We've done the scouting work for you and provide you with the names, phone numbers, and email addresses for our most trusted and helpful contacts. This information is worth its weight in gold (and could save you thousands of dollars). A brief, concise history of Spain, which puts today's economic and political situation in context and shows you why there's opportunity on the ground there today. The low-down on Spanish in Spain, how it differs from Latin American Spanish (very little, in fact), why it's a great place to learn Spanish (and the best places to go to do just that), plus useful vocabulary for everything from shopping to measuring to meals. A region-by-region assessment of the spots most worth your attention in Spain today — so you can begin to match what you're looking for with a place on the ground. You'll know what to expect and what to look for, with guidance about everything from towns we like to specific neighborhoods worth checking out. You'll get the straight story on what properties, rent, and day-to-day life cost and how the character of each place is different from the next. The how-to steps to buying property in Spain. It's not overly complicated to buy in Spain—but it's not the same as buying in the US or Canada, either. Find out the differences between buying an existing property versus new construction and the four steps you go through anytime you buy, no matter what kind of property you've chosen. The charges you can expect when you buy in Spain. Generally speaking, closing costs, taxes, and other costs related to buying a property in Spain will run you between 10% and 14% of the purchase price. Find out how it all works and who traditionally pays what, including an insider's tip about the seller's capital gains tax—and how you can ensure you don't get stuck for it. What you need to know about visas and residence and why, in fact, you may want to keep your boots on the ground in Spain only 182 or fewer days a year. The cost of living, including a sample budget, plus specifics about costs for all kinds of things you'll need—from real estate to clothing, electronics, meat and fish, bus and train fares, healthcare, eating out, and more. Good news is: A couple can live very comfortably here—in a lovely apartment or home, dining out regularly and eating well, enjoying all Spain has to offer—for about $2,000 a month (that's less than $25,000 a year). How to easily get your pet into Spain. The process isn't complicated at all—before you go, you get your dog or cat a rabies vaccine, a chip, and have some paperwork filled out. Once you're in Spain, you get a "pet passport" for travel within the EU. We lay it all out—including the specific forms you'll need—in Escape to Spain. VAT, property tax, income tax—find out what you may owe and how to arrange your affairs so you can minimize your tax obligation. In a full chapter on taxes in Spain, we lay out the way the system works and how much you can expect to be charged. It's dependent on how you use your property and whether you're resident in Spain or not. In Escape to Spain, we lay it all out so it's clear and easy to understand. What you need to know about moving your household goods to Spain. Find out what's worth bringing (probably less than you think) and how you can ship duty-free what you do decide to move. Plus all kinds of useful, money-saving hints, like this one: Spanish beds aren't the same size as US beds, so don't bother bringing linens, they just won't fit. Whether you're looking for beautiful beaches, golf, historic architecture, sightseeing, adventure sports, great food and wine, or simply walking, you'll find it in Spain. Go a few miles into Andalucia's hinterland to find white-washed villages on mountain slopes. Drive the winding coast of northern Spain's Bay of Biscay, where green mountains tumble almost to the sea. Here, beyond bustling beach resorts like San Sebastián and Santander, you'll find less-visited fishing villages along the Cantabrian and Asturian coasts. Wander the vast, lonely stretches of Castilla-La Mancha, stopping to savor towns like Chinchón and Almagro, whose stately buildings speak of former wealthy days. Explore the many provincial capitals—Avila, Oviedo, Zaragoza, just to name a few—that are rich in history and charm. For every cliché—sangria, bull-fighting, and flamenco—there are a hundred secrets just waiting to be discovered. • How to snag bargain airfares to Spain—and around the country once you're there, including the discount carriers a typical web search won't reveal. • Where to find an authentic Old World Spanish lifestyle without sacrificing any first-world luxuries. In this gem of a La Rioja wine town, you'll find a perfectly preserved medieval village surrounded by battlements on a low hill against a backdrop of mountains. • Where to find the best-value wine in Spain... and an $11 three-course meal while you're at it. • The best tapas in Seville—including ham and peppermint croquettes and pork in a spicy "mojo" sauce—all for less than $5. • Plus lots, lots more... like where to learn about bullfighting..undiscovered wine towns...and the list goes on... we guide you as you plan your trip—including recommendations for hotels and activities you shouldn't miss. We've gone through Escape to Spain: Everything You Need to Know to Retire Better, Invest Well, and Enjoy the Good Life For Less page by page and sentence by sentence to ensure that all the information and recommendations...all the resources and contact details, including websites, email addresses and telephone numbers...all the maps, statistics, dollar figures and prices quoted...are completely up-to-date. We've left no stone unturned. And the best part is that we publish this manual electronically...so it's not just useful, but also colorfully illustrated and interactive. There's no debate: Escape to Spain is the best guide available to a comfortable retirement in enchanting Spain. We spent many months—and tens of thousands of dollars—putting it together. It would be easy to justify a price tag of $200 or $300—and, frankly, it would be worth every penny. But right now you can put your hands on all of our current on-the-ground guidance, advice, and recommendations for just $99. That's a serious bargain considering this guide could save you many times that in time, money, and frustration. Request your copy of Escape to Spain: Everything You Need to Know to Retire Better, Invest Well, and Enjoy the Good Life For Less now and you'll have it in your hands just as soon as your order has processed. I'm so confident you'll be impressed by all the useful insider guidance our manual includes—and by all Spain has to offer—that I'll give you a 30-day, no-hassle, money back guarantee. If for any reason you're not completely satisfied with the depth and breadth of information and guidance you find in Escape to Spain: Everything You Need to Know to Retire Better, Invest Well, and Enjoy the Good Life For Less, simply let us know within 30 days and we'll refund your purchase, no fuss, no questions asked. Right now we're offering a special deal for anybody who orders Escape to Spain. When you request your copy now, we'll send you a little something extra—free. Free Special Bonus #1: Gracious, Good-Value Spain: Where You Can Enjoy "Old World" Living at Latin American Prices (value: $27, yours free). As I've said already: Spain makes very good sense right now. But not everywhere offers equal value. A lot of "cheap stuff" was thrown up in Spain in the boom times—much of it sub-par in construction (and often permitting). You may see ads for these places, but they do not represent good value at all. In Gracious, Good-Value Spain: Where You Can Enjoy "Old World" Living at Latin American Prices, we share with you the cautions you should be aware of—as well as our top picks for best-value locales today. You'll find out secrets like the best places to watch for fire sales... and how to know if a place is worth your attention or not. We'll tell you about a comfortable, casual coastal community of 182,000 that flies well under the North American radar screen. The temperatures are moderate all year here. Average summertime highs are in the mid-70s F, while winter lows average in the low- to mid-40s F. And values are very good. You can buy a comfortable, 700-square-foot apartment starting from about $200,000, and rent one long-term from about $600 a month. You'll find out about a great community outside Barcelona that keeps you within easy, quick reach of the city but offers you lower prices, a more laidback lifestyle, and great beach access. It's a lively place filled with cafes, and though it's at the coast, it's a proper "business" city, which means you'll see guys in suits and women in sweater sets. Yes, tourists come here, but it's a proper, year-round town. And you can own a renovated 2-bedroom apartment close to the beach in a building with a parking space, pool, and green areas for about $206,000. A three-bedroom, two-bath apartment in central Castelldefels, right next to the pedestrian-only area, is available. It has 968 square feet of space and has a terrace. Price: €115,000 ($129,500). This report explains how, in just a few months from now, you can be set up to live and earn in Spain thanks to a government program that wants to pay people from the U.S. and Canada. They'll set you up with a visa and a contract. You'll spend just 12 hours a week earning an income in Spain. No experience necessary. Spain and Portugal offer some of the lowest-cost living in the Old World… along with plenty of charm, history, and an enviable lifestyle. In this video presentation, we’ll give you the scoop on attractive destinations, the cost of living and real estate, and how to make these Old World havens your new home. But it’s yours today for only $99. The best part is that we publish this bundle electronically in PDF format… so it's much more useful, colorful, and interactive than ever before. And you'll have access to it as soon as your order has processed. If you would to order a print version of Escape to Spain then please click here. These special reports are yours today, free with our compliments, when you order Escape to Spain. And they're yours to keep, no matter what, even if you decide to request a refund. I don't think you will, though. I feel confident you'll be impressed by the deep wealth of research, guidance, and on-the-ground recommendations Escape to Spain and our special reports deliver. There's no better way to launch you on your way to an enjoyable life in sunny Spain—on a budget you'd expect to see in Latin America. If you like the idea of a locale that offers sophistication, charm, and all the comforts and excitement of Europe—at a price you'd expect to see "south of the border"—look no further today than Spain. P.S. With Escape to Spain: Everything You Need to Know to Retire Better, Invest Well, and Enjoy the Good Life For Less in hand, you'll have exactly the guide you need to help you see the opportunities in Spain that make the most sense for you and home in on them quickly and efficiently. Today, in the right places, you really can find values you'd expect to see in Latin America. But here they are in Europe—and not just anywhere in Europe—but in sunny, friendly, culture-rich Spain. This is the kind of opportunity that comes around once in a lifetime. If you've always liked the idea of a retreat in Europe... of a place you could return to again and again where it's safe... the pace of life is slow... the culture values family, friends, art, music, good food, and rich experiences... then Spain deserves your close attention today. 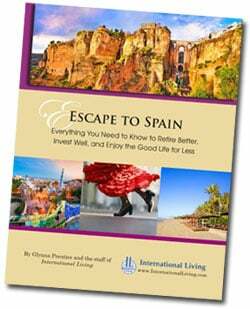 With Escape to Spain: Everything You Need to Know to Retire Better, Invest Well, and Enjoy the Good Life For Less you'll have exactly the guide you need to take the idea you have in your mind's eye and make it your reality on the ground in Spain. It's a modest investment that could enrich your life immeasurably. Give it a try today—if you don't like what you see, just let us know within 30 days and we'll give you a full refund. With this special deal we'll also send you four special reports, Gracious, Good-Value Spain: Where You Can Enjoy "Old World" Living at Latin American Prices (value: $27, yours free) … Spain's Secret Income Opportunity(value:$23, yours free) ... Spain & Portugal: Low-Cost, Laidback Europe (value $29 – yours free) and Sunshine, Tapas, Great Healthcare and More: The Secrets of Southern Spain Revealed (Value: $19, yours free). And they're yours to keep, no matter what.